SurveyMonkey is a cloud company that offers web survey forms to over 15 million users, who made this service one of the top 500 visited site in the world. Built from the ground up to allow its users to create every type of survey imaginable, SurveyMonkey has managed to become leading web destination where you can quickly design survey from scratch or by editing template, automatically gather data from users who received surveys, and analyze those results with industry leading tools. Create and publish online surveys! SurveyMonkey can increase customer satisfaction, organize events, preform easy market research, manage human resource and more. Online surveys are viewed today as one of the most integral parts of marketing research that every serious company or organization has to use to keep in touch with the state of the market, wishes of their user base or as a tool for testing future plans and products. To do this, many home and professional users are seeking survey tools that are highly capable and scalable, able to reach any amount of people and analyze collected data into meaningful information that can be implemented in the future planning. One of the best online survey tools of today is SurveyMonkey, top-500 ranked website that managed immediately after its creation in 1999 to become leader in the sphere of survey management, data collection, analytics and professional-grade tools. Originally created by Ryan Finley and Chris Finley, this very large company continues its rise with each passing month. Create and publish online surveys! 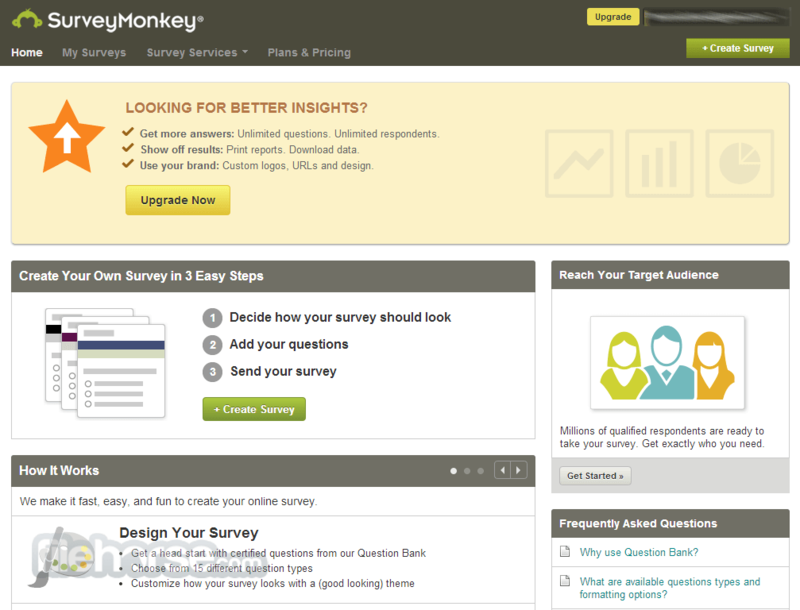 SurveyMonkey is one of the most popular web survey services on the current market. It offers its cloud-based tools to over 15 million individuals and business users from all around the world, who all want to easily create, manage, deploy, and receive data from professional looking surveys. Built from the ground up to have perfect mix of user friendly interface and powerful tools, SurveyMonkey is used each day by users who want to easily reach target audience in marketing, education, human resources, and many other tasks that demand effortless gathering of data from end users. By having easy and versatile tools for collecting user feedback, planning events and analyzing current market, SurveyMonkey can help anyone to save their time, increase their productivity, and automatically do many steps of the process that would otherwise demand the engagement of professionalprogrammers, web designers, data analyst and other highly skilled professions. 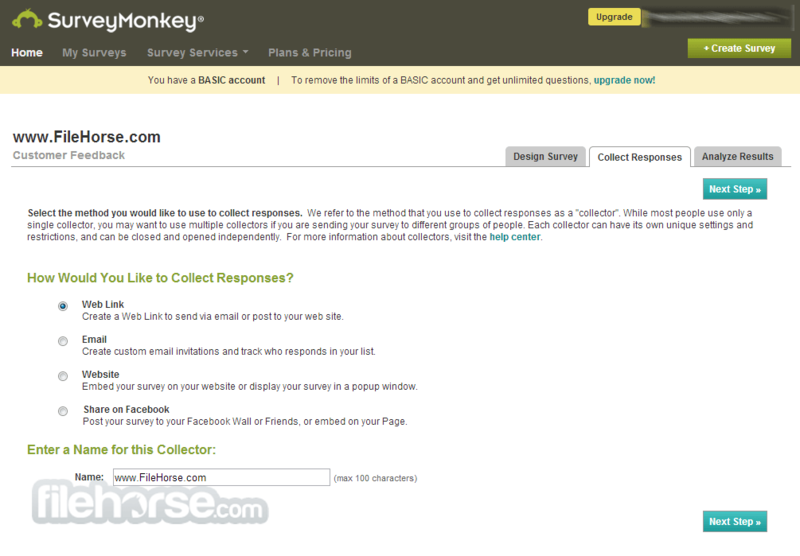 The core offering of SurveyMonkey is separated in six steps that everyone will know to appreciate. This includes easy survey creation (which includes 15 types of questions, use of multiple answers, question templates…), custom branding support, advanced features (answer randomizer, interactive elements, question piping…), deployment services for enabling you to reach target audience better, response collection tools (overview easily usable even on mobile devices) and robust reporting tools that can showcase data with many types of charts, filters and cross tabs. These six main sections of SurveyMonkey’s offering are just core tools, which can be augmented with access to more robust security measures for protecting your data, full API integration and much more. SurveyMonkeyuses very user friendly, simple and well-organized interface to enable users of all technical levels to easily navigatye to all of its site sections, easily use tools and create, deploy and receive data from professional-looking surveys. Main dashboard of this weba app serves as great place for survey creation, maintaining all your current projects and analyzing sets of surveys. Even though much of the SurveyMonkey’s abilities are focused on professionals and large businesses, this service also offers free tier of use that is allows only 10 questions per survey and tracking of just 100 responses. This can be augmented with three paid tiers that range between €25 per month and €800 per year. 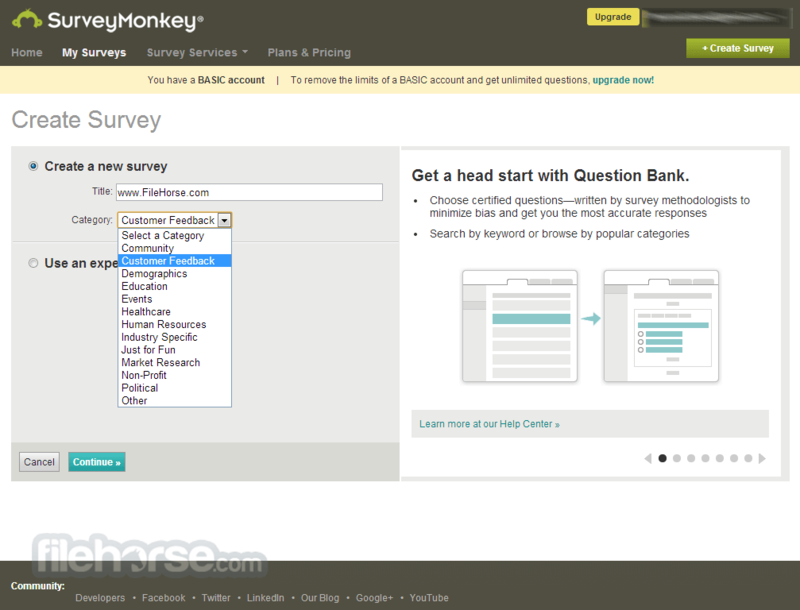 SurveyMonkey is a perfect service for anyone who wants to control everything about their surveys. With 15 question types including rating scales, multiple choice, and more, it's easy to create online surveys from scratch. Or, choose certified questions from Question Bank, our library of question templates. Customize the look and feel of your surveys. Add your logo, company name, colors, and images. Create your own survey URL and send respondents to a promotional landing page upon survey completion. Create and publish online surveys! Get the data you need with required questions and response validation. Eliminate bias with random assignment (A/B testing) and randomization. Create interactive surveys with skip logic and question piping. Need the insights of moms in Texas or the general US population? SurveyMonkey Audience gives you access to millions of respondents ready to provide the answers you need to make critical decisions. Gather responses with one handy URL by including your link on emails, websites, Twitter, Facebook, and more. All of our survey templates meet Section 508 accessibility standards. Plus, they look great on just about any device. Gain insights with real-time charts and graphs, slice and dice data with filters and cross tabs, and download results with a variety of export options. Get the most out of your data and act faster. We proudly display the most recognized online trust seals, including Norton (formerly VeriSign), TRUSTe, McAfee and the Better Business Bureau. You can trust us to keep your data private, safe and secure.